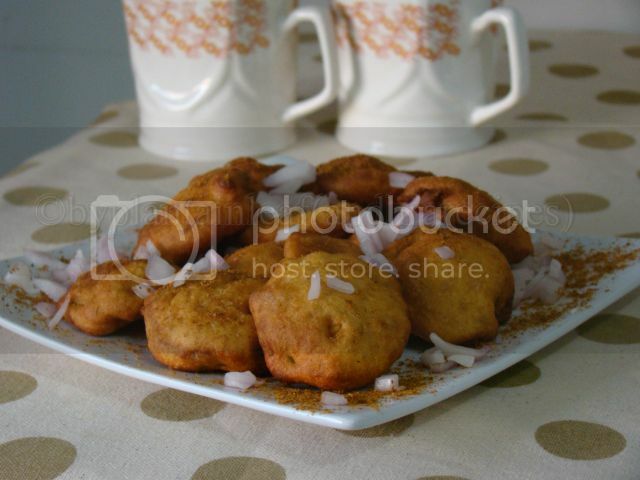 Fourth week of BM#17 starts from today and I have chosen "vadas / fritters" as my theme. I am going with these crispy, urad dal fritters for my Day 1 post. These vadas are used to form the "vadamala" - the garland of urad dal fritters, offered to Lord Hanuman on Hanuman Jayanthi festival or as an offering at temples. While the regular vadas are soft and fluffy these are on the crispier side and are spicy. Though traditionally made for religious purposes, they are a wonderful accompaniment to evening coffee / tea. * Soak urad dal for about an hour. Drain and grind dal into a coarse, thick batter adding no water. Or add a couple of teaspoons of water if grinding becomes difficult. * Meanwhile, start heating oil in a frying pan or a kadai on medium flame. * Transfer the ground dal to a bowl. Add rice flour, crushed pepper, salt and a Tbsp of hot oil to the dal and mix well. Addition of rice flour and hot oil is to ensure that the vadas stay on crispier side. * Take a big marble sized batter and pat the batter ball as thinly as possible on a greased plastic sheet. Poke a hole at the center with the index finger. Open your right hand and gently flip the sheet onto the fingers so that disc is transferred to your hand. Gently slide it into the hot oil for frying. Fit as many vadas as the kadai can hold. Fry them on low - medium flame until golden brown. Keep flipping in between to ensure uniform cooking. If vadas are made for snacking, there is no need to poke the holes in discs. The holes are meant to thread the garland. 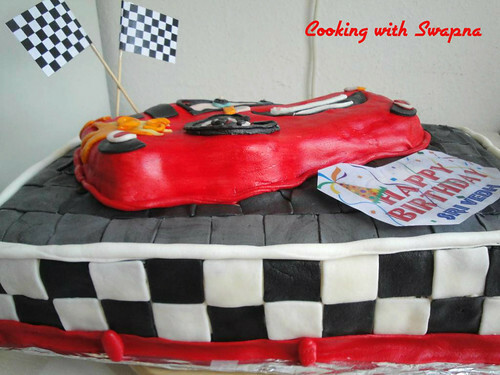 * Repeat the steps with the remaining batter, greasing the plastic sheet each time you use it. * Store them in an airtight container. Once I had gone with my friend to visit her grandmother. My friend's aaji's house was near Pune. For lunch, aaji had made delicious daalichi amti. One unique thing that I noticed immediately was that the aamti was flavored with olya kaandyachi paat or spring onion greens. It was so different and delicious. Aaji had a little garden in her backyard and she shared that she would add the fresh herbs to the daily daal and each herb added its own unique flavor. My friend's aaji's Daal was my inspiration when I decided to add chives from my backyard to my daily daal. Chives has a mild flavor - kind of a cross between garlic and onion. So it worked perfectly with my daal. 2. Heat oil in a saucepan. 3. Add all the seeds. Add garlic cloves and chives greens. Saute for few minutes. Now add goda masala and paprika. Saute again for 1 minute. 4. Add cooked & mashed toor daal & water as needed to adjust the desired consistency. 5. Now add salt, tamarind and jaggery. Bring to boil. 6. Switch gas to low and let it simmer - stirring in between - for at least 10 minutes. 7. Garnish with more chives greens if you like. 1. Do not make this daal watery. 2. Similar daal can be made using garlic greens or onion greens. 3. As a variation, you can add mixed daals instead of using just toor daal. I am an ardent fan of a cooking show that airs on one of the popular Telugu TV channels and I particularly like the chef's style of cooking. I am no longer watching the show but have some interesting and traditional recipes scribbled in my journal from the past shows. One of those happens to be these punukulu. Punukulu / punugulu refer generally to the spicy fritters made with dosa / idli batter that is served as breakfast in Andhra homes. Though I am well versed with the spicy version, we are not the ones who would go with an oil filled kadai for the breakfast. 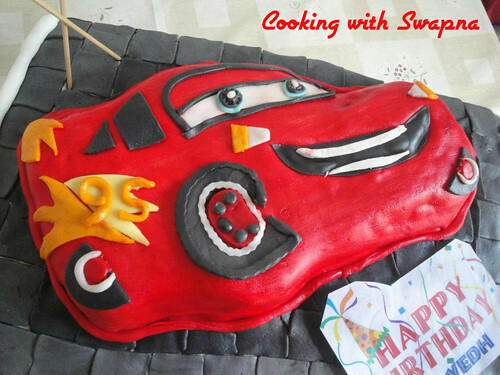 I was contemplating whether to go with this traditional dish for this BM when I suddenly remembered the sweeter version from the show. I had jotted down the recipe since it was intriguing and probably if not for BM, I wouldn't have tried it. :) I prepared a small batch today and they came out really good. The recipe is a simple one and also the punukulu can be prepared quickly. These moong dal fritters are not overtly sweet and are delicious with subtle hints of pepper. * Heat oil in a frying pan. * Wash and soak moong dal for about an hour. * Drain moong dal completely and grind without adding any water. * Transfer the ground dal to a bowl, add the remaining ingredients to it and mix well. * Take small portions of the batter, shape into balls and drop into the oil. Or drop spoonfuls of batter into the hot oil. Fit only as many as the frying pan holds. * Fry on low flame until golden brown, turning around intermittently with a spoon ensuring that they are cooked through. * Remove them with a slotted spoon and drain on paper towels. I got introduced to this Watermelon-Rose syrup combo after my marriage. My MIL makes two types of these watermelon-rose drinks especially on the hot, sweltering summer days in India. 1. Place bite sized watermelon pieces in tall serving glasses. 2. Pour Rose syrup per glass. 3. Pour ice cold water and stir. 4. Serve immediately with a tall spoon and a straw. 1. Garnish with mint if desired. 2. You can use a melon scooper to make small watermelon balls. Wash taro in running water and pressure cook it with enough water and salt for 3 whistles and sim it on low flame for 3 minutes. Switch off the cooker and once it cools discard the water totally and peel the skin.Cut the in circles with a 1/2 cm thickness. Heat oil in a pan and deep fry them till they are crispy and golden brown.Serve immediately with the dip. It can also be served with rice. Grind all the ingredients to a smooth paste for the dip, traditionally it is crushed in mortar and pestle. Note: It is ideal to prepare the dip before the fry as you can serve the taro fry crispy with the dip. My Vegan co-worker wants to learn some Indian cooking with me. So I am trying to veganize some of my recipes. Before we actually cook together, I would like to make those dishes, taste them, take notes and be confident that they would work for my friend. So this is my first attempt at making a Vegan dessert by replacing milk with non-dairy milk. When thinking about Vegan Indian desserts - without tweaking anything - I can think of Puran PoLi and Ukadiche Modak which are totally vegan. Of course they are served with clarified butter/toop/ghee, but if you hold that off, these are vegan desserts. But I don't think that we have that much time to make Puran PoLi or Modak. So I thought of tweaking my Shevyachi Kheer recipe. I went to the Whole Foods to check out the "non-dairy" milk. There were plenty of options which made me dizzy. Rice Milk, Soy Milk, Almond Milk, Hemp Milk, Oats Milk. Finally I decided to use "Almond Milk" thinking we use almond slivers in many Indian desserts so it may work ok. When I tried the recipe, I was pleasantly surprised to see the result. I was feeling a bit adventurous that day so instead of sugar, I used "Agave Nectar". 1. In a heavy bottomed saucepan, roast vermicelli lightly on a low flame. 2. Add almond milk. Bring to boil while stirring continuously. 3. Add agave nectar or sugar and crushed cardamom powder. 4. Simmer for few minutes. 1. If made too much in advance, vermicelli may soak up all the almond milk. In that case, add some more almond milk and adjust agave nectar/sugar accordingly. 2. You can use more agave/sugar if you want your kheer to be sweeter. 3. I like to keep some liquid in my kheer. But if you want you can decrease the amount of almond milk and make thick pudding. 4. If you like, you can also add some raisins and almond slivers. Roast them before roasting sevya and let them plump up in the almond milk. 5. 1 tsp sugar = 1 1/4 tsp Agave Nectar. So use it accordingly. 6. For making Indian desserts, I buy vermicelli from the local Indian stores. A traditional dish always brings back sweet memories of childhood.And my mom was a expert to dole out so many savory dishes throughout the year.She ensured every season and moment had a special dish.She recently came over and I requested her to prepare this savory green gram bubbles tradionally known as pesara pindi bellallu. The texture and flavor of this savory evening snack can make your family rejoice the moment.The best part is it should be eaten warm with unlimited servings of ghee.! !So enjoy this savory snack my mom has prepared for me and my hubby. Mix all the above ingredients except sesame. Add enough water to it into make a nice soft dough.Divide the dough into equal part of medium size balls.Sprinkle sesame on each ball.On a plastic sheet take each ball and press it firmly to shape it in a round shape. Heat oil in a pan and deep fry it on a medium flame till each side is golden brown. Serve warm with a dash of ghee. 1. To make green gram flour grind it into a fine powder and sieve it. 2.While pressing each ball do not press to much, it should be little thick for it to bubble. Sunday means waking up late in the morning have a heavy breakfast, this is the time table for us almost every Sunday. Like every Sunday we wake up late in the morning, we have Pesarattu- upma and Allam chutney with coffee for break fast. This is a quite a heavy breakfast so we want to do some work to digest that heavy breakfast. So i changed mud from my pots and put some new plants and cleaned the place where i kept the pots. Still we are not hungry we went out for our week end shopping to by vegetables and other stuff. When i enter the vegetable and fruit shop this green apples said welcome to me i was very happy to see this green fresh apples and i picked some. That time i didn't have this salad idea in my mind. when we come back home, Feeling little hungry so my husband surprisingly asked me to make a salad and some drink. 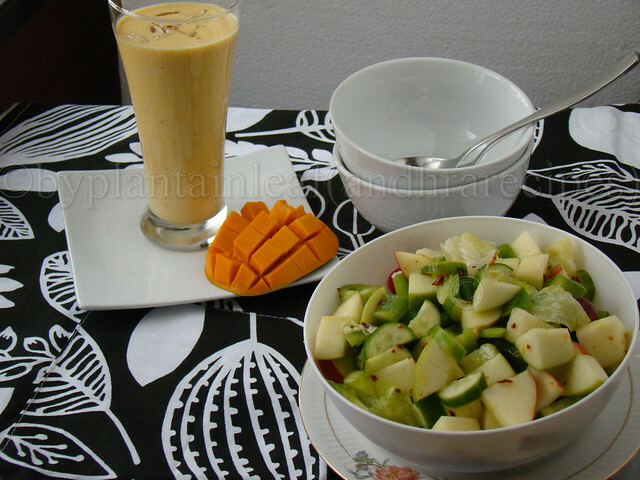 Then i thought of making green apple salad with mango badam milk (recipe coming up). I didn't have any idea what dressing i am going to add to this salad. I just added what i have in my ketchen and what i like, even vegetables and fruits what i brought from the market i used them in this salad. And the salad came out really so delicious. From now this is going to be one of my favorite salads. That crunchy vegetables and fruits make you very refreshing. Like me hope you also like my salad. 1. 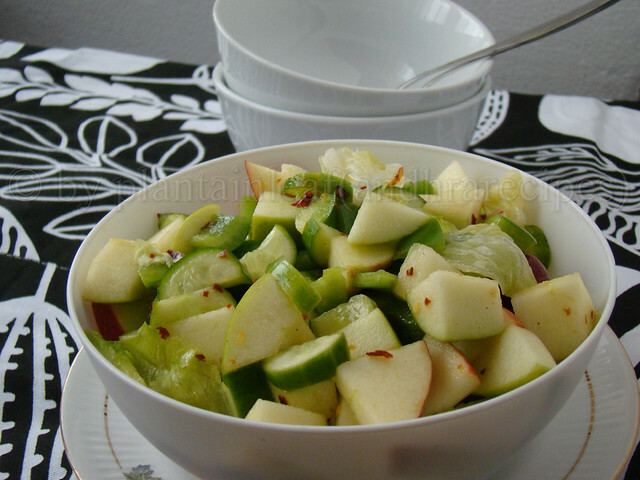 Cut apples in to bite size pieces apply 1 tea sp lemon juice set a side then cut the other vegetables because apple changes it's color if you cut and leave it like that. 2. Mix all dressing ingredients in a big mixing bowl and whisk well to combine every thing. 3. Now add fruit and vegetable pieces to the dressing and mix gently to coat the dressing over the vegetable and fruit pieces. Raisins --- 2 tab sp Soaked in water for 10 minutes then drain the water. 1. In a big mixing bowl mix all dressing ingredients and whisk well to conbine every thing. 2. Add all vegetable pieces, raisins to dressing and give a good toss. 3. 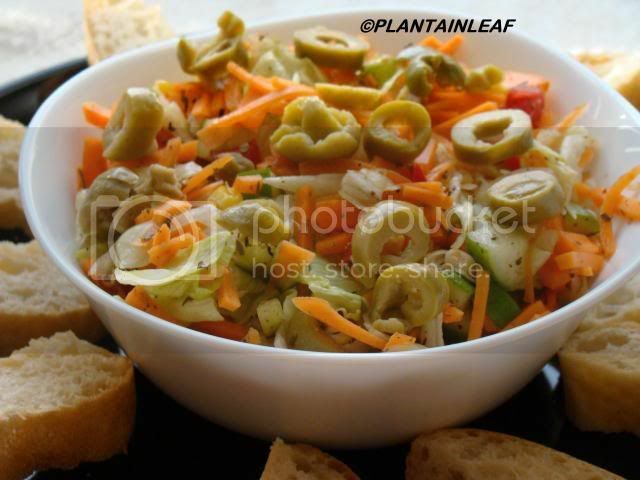 Add olive pieces to salad and mix well gently and leave it in the fridge for 1 hour then serve chilled with bread or roti. 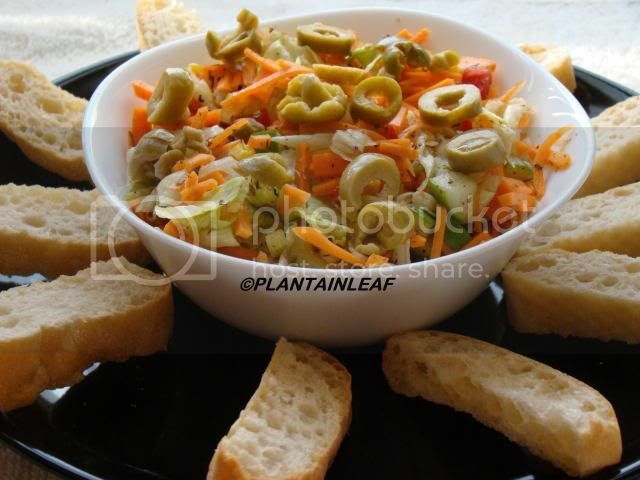 You can use this salad as sandwich filling or a kati roll filling good idea no:). Finally , the summer seems to be here and suddenly we are craving for cooler things. The two ideas, a smoothie and a yogurt posted today were prepared to beat yesterday's heat. They use the store bought granola bars and yogurt and suit my BM theme of "Food prepared using ready made stuff". Check what the other marathoners are cooking during BM#17. * Place yogurt, milk, fruits, 3/4th of the granola bars and sweetener if using in a blender. Blend until smooth. * Pour into glasses. Crumble the remaining bars and sprinkle in each glass. Garnish with strawberry slices if desired. Serve immediately. Another cool snack idea for these sultry days. Though I am not a yogurt - granola parfait eating person, a fruity yogurt sprinkled with a small quantity of nuts and crumbled granola bar is appealing to me. Here is blueberry Greek yogurt sprinkled with almond and crumbled granola. Either get blueberry yogurt from the store or prepare your own. Using Greek yogurt is the shortcut version but straining the yogurt in the refrigerator for a few hours will also give the same results. For each cup of Greek yogurt, pulse about 2 Tbsp of blueberries coarsely. Add crushed berries and sweetener to the yogurt and stir. 4 - 6 fresh berries can be added as well. Sprinkle with nuts and granola bar pieces if desired and serve immediately. At any given time, I will also have a huge carton full of MTR instant mixes of all kinds. Not that I need instant mixes or use them enthusiastically but my husband feels that they will come handy during time crunches. For the first day post, I made use of MTR's bisibelebhath powder to prepare bisibele huli using oats and masoor dal for a quick and healthy lunch. If you are bored to eat the mushy, bland oatmeal but would like to incorporate it into your diet, here is a spicy oatmeal preparation. This doesn't need even a pressure cooker as masoor dal cooks quickly and this comforting, one pot meal can be put together in around 20 minutes. * Wash masoor dal in two exchanges of water. Add washed masoor dal, prepared vegetables, turmeric powder and about 5 cups of water to a pan and cook until masoor dal is done. It will take around 15 minutes. * When masoor dal is cooked, add bisibele bhath powder, salt, tamarind and oats. Continue to simmer until oats are cooked through. * In the mean while, heat ghee in a small pan and toast the tadka ingredients. 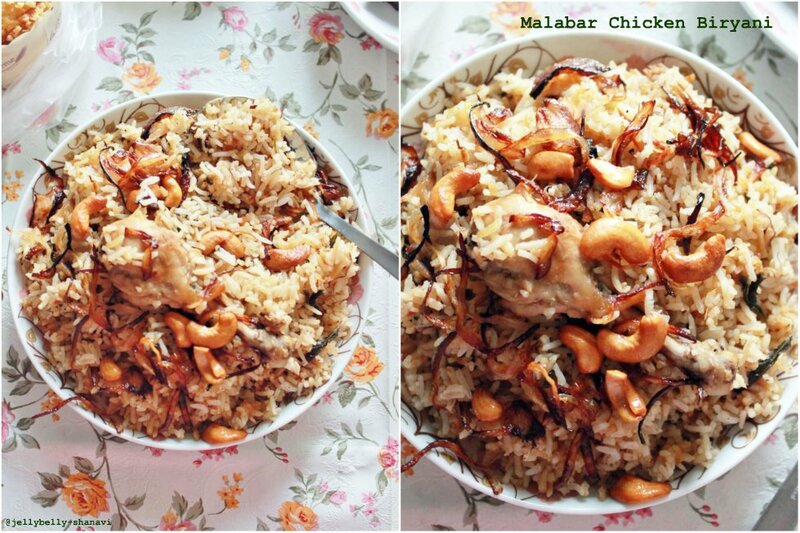 When cashews turn golden brown, remove and add to the cooked oats - dal mixture and mix well. Serve warm with papad / chips / khara boondi. I use Rainbow Chard regularly in my American kitchen. It's easily available at the supermarket. It is very beautiful to look at as each leaf has a different color. and most importantly, this leafy greens does not have any strong, unique flavor or rough texture. So it can be used in any recipe without any issue. 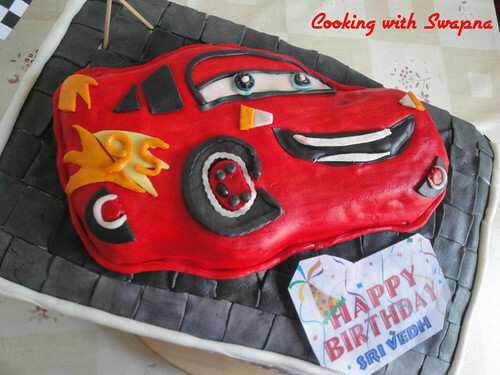 I was planning to make bhaaji very similar to Shepu chi bhaaji that I had blogged earlier. However, as all homecooks know, we change, twist, tweak the recipes based on the ingredients available in the pantry. So I changed this recipe very slightly. You can follow exactly same recipe as Shepu chi bhaaji for a variation. 1. Soak moong daal for 2-3 hours. Drain. 2. Heat oil in a saucepan/kadai. Add garlic. Saute for 1 minute. Add onion and turmeric powder. Saute till onion is soft. 3. Now add drained moong daal. Saute for 2 minutes. 4. Add chopped chard. Stir fry. Sprinkle some water drops. 5. Cover with a lid. Pour water on the lid. Let it cook. Check from time to time to make sure that the bhaaji is not sticking to the bottom of the pan. Sprinkle few drops of water if needed to prevent burning or sticking. 6. When bhaaji is cooked and wilted, add peanut powder, salt and sesame powder if using. 7. Saute till there is no water. Serve hot with chapati or bhakri. 1. Every moong daal grain should be seen and it should not be a mush. 2. Regular red or green chard can also be used. I prefer rainbow chard since it has many colors. In this recipe i used fresh cherry s, today morning i saw fresh Cherry's in the market I couldn't stop my self buying them, i picked some of them so i add them to my salad. You can replace them with black or green grapes. 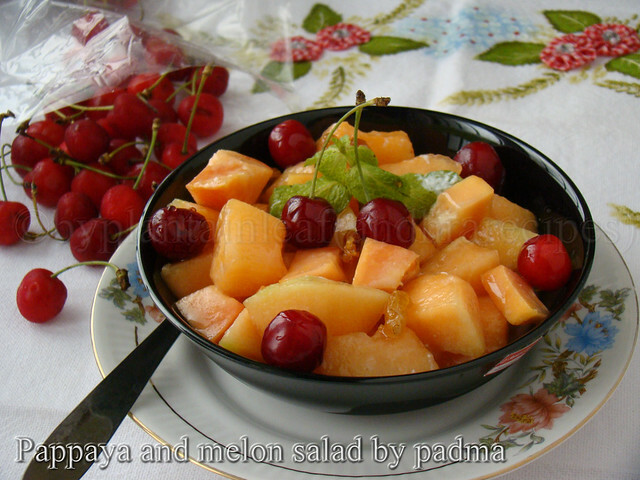 But don't use any caned fruits they don't give fresh flavor to the salad. Papaya ---- 1 small peel and cut in to bite size pieces. 1. In a bowl mix dressing ingredients mix well. 2. Add fruits pieces to the dressing keep a side few cherries to garnish, toss well. 3. Serve chilled garnished with cherries and mint leaves. My husband started throwing me options when I went to him to get some ideas for this week's marathon. His suggestions however made me suspect whether he was really serious or gone delirious with his work load. He had flown from his work the previous night, worked way past midnight and was up in the morning again with his laptop on. And so instead of arguing over trivial matters and getting preached on how I refuse to see beyond my mother's kitchen, I walked out of the room and began thinking about it. Among the ones, a few seemed feasible like this poha one. My husband had claimed that he had eaten it somewhere but I wasn't sure whether he was joking or serious. However I tried it since the idea of poha halwa seemed appealing. I loved it and it is a simple and quick option when you are looking for some yummy stuff to satisfy your sweet tooth. * Melt the ghee in a pan and add raisins - cashews to it. Toast until the raisins become plump and cashews turn golden brown. Remove them with a slotted spoon and keep them aside. * To the same ghee, add poha and toast on low flame until it starts to change color. Transfer the poha to a plate. * Add milk to the same pan and heat. Then add the food color, toasted poha and coconut and cook on low flame until poha is done. * Next add sugar and cardamom to the poha. Continue to cook until the sugar gets dissolved and incorporated into the mixture. * Turn off the stove and add the cashews and raisins toasted earlier to the halwa and mix well. From this month, the marathon is going to be for 4 weeks - each one with 3 days of posting. And so, this edition of marathon seemed like a breeze and it's time already for the final post for the first week of BM#17. * Remove the crusts from the bread slices and cut the bread into small pieces. Toast them in the ghee until golden brown and keep them aside. * Heat the milk in a pan. Add sugar and cardamom and wait until sugar dissolves. Add the bread pieces and cook on low flame until they get cooked and incorporated into the milk. Turn off the stove and garnish with nuts. * This can be served either warm or chilled. Freeze the crusts instead of trashing and when you have collected a substantial amount, just process them to prepare your own bread crumbs. When Barbara @Andrews McMeal Publications asked me if I would like to review a new Indian book "Quick-Fix Indian: Easy, Exotic Dishes in 30 Minutes or Less by Ruta Kahate, I accepted the offer very happily. After all, I love to read cookbooks like storybooks. They are even my own bedtime books. So I was happy to receive a new book. In a few weeks, I received the book by mail. Ms. Ruta Kahate is a best selling author of "5 spices, 50 dishes". She ran a cooking school in california. She loved to make everything from scratch. But when her two daughters were born , she wanted to tweak the recipes and make them simpler. That's when she discovered her own shortcuts and convenient techniques. Ruta provides a shopping list for a well stocked pantry for a busy homecook. All the recipes of this book are quick and easy to follow (Instant Biryani, anyone?) Of course Ruta admits that this isn't 2 minute Biryani recipe but the overall time is substantially reduced and hence it's relatively "instant". I tried her pickled cucumber recipe which we enjoyed. If you ask me what I had wished more from this book? then my answer would be some colored photographs would have made this book more vibrant. 2. Mix all the ingredients using your fingers. 3. Let it sit in the refrigerator at least for 10 minutes before serving. Take a bowl and mix all the ingredient in toppings and let it marinate for 20 minutes.Boil the spinach for 2 minutes in microwave and make a puree out of it. To make sauce heat oil in the pan add cummin seeds and when it splutters add onion and garlic, and let it fry till onion becomes translucent. Then add ginger garlic paste fry for another 1 min, then add tomatoes till they become soft. Add all the masalas and fry till begins to saturate. Now add spinach puree and let it boil for 5 min on medium flame.Add kasuri methi cook for a minute and switch off the flame. To prepare the pizza , spread the sauce on the pizza base, sprinkle mozzarella cheese, add the toppings and grill it for 8-9 minutes.Your pizza is ready to eat.